These barbecue pork chops and cheesy ranch-seasoned potatoes are cooked in separate packages in the same large slow cooker. Your family will ask for this meal again and again! This is a complete meal cooked in the slow cooker. The pork chops are cooked in a slow cooker cooking bag and the ranch seasoned potatoes are cooked alongside the chops in a foil packet. This meal fits nicely in a 6- to 7-quart oval slow cooker, but a large round cooker should work as well. I topped the finished potatoes with extra cheese and put them under the broiler for a few minutes before serving. In a saucepan combine the beer, stock, or water with the ketchup, vinegar, brown sugar, molasses, Worcestershire sauce, onion powder, liquid smoke, salt, 1/4 teaspoon of pepper, and cayenne pepper, if using. Stir to blend and bring the mixture to a boil over high heat. Reduce heat to medium-low and continue cooking, stirring occasionally, for about 6 to 9 minutes or until the sauce has reduced by about half. Meanwhile, following the cooking bag package directions, place a bag in a large slow cooker. Add the pork and sliced onions; pour the reduced sauce over the chops. Close the top of the bag as instructed with the nylon tie. Peel the potatoes and slice or chop in 1/2- to 1-inch pieces. Put the potatoes in a bowl and toss with the green onions, melted butter, dressing mix, 1/4 teaspoon of pepper, and the 3/4 to 1 cup of shredded cheddar cheese. Place a large sheet -- about 18 inches by 24 to 30 inches -- of heavy duty foil on the countertop and spray it generously with nonstick cooking spray. Mound the potato mixture in the center of the foil and fold it over to enclose the potatoes completely. Make two smaller packets if you are using a 12-inch roll of foil. Place the packet in the slow cooker next to the pork chops. Cover and cook on HIGH for 3 1/2 to 4 hours, or until the potatoes and pork chops are tender. Or cook on LOW for about 6 to 8 hours. Move the pork chops to a platter and tent with foil to keep warm. Skim the fat off the top of the remaining liquid or put it in a gravy separator. Pour the skimmed liquids in a saucepan and boil for a few minutes to reduce and concentrate flavors. Open the potato packet. Transfer the potatoes to a serving dish or sprinkle them with extra cheddar cheese and place the open packet on a baking pan; broil just until the extra cheese has melted. 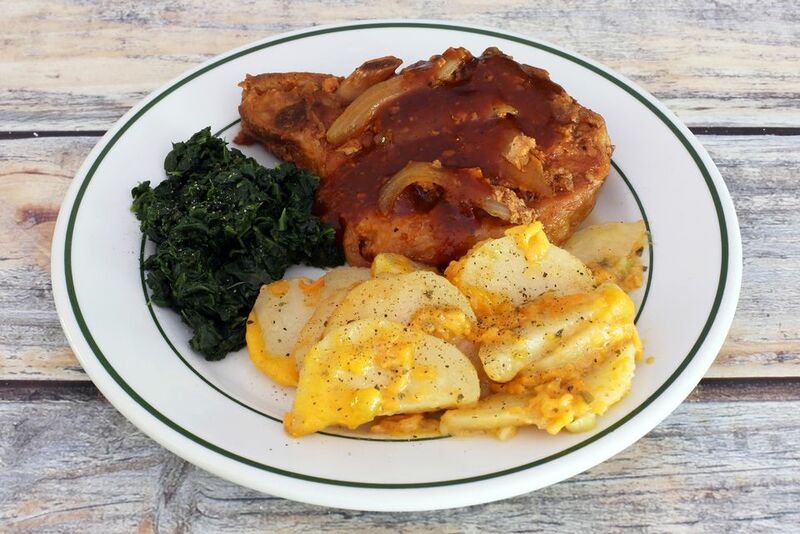 Spoon the sauce over the pork chops and serve with the potatoes, along with spinach, steamed broccoli, or your family's favorite vegetables.